Don’t ask if you don’t want to know! 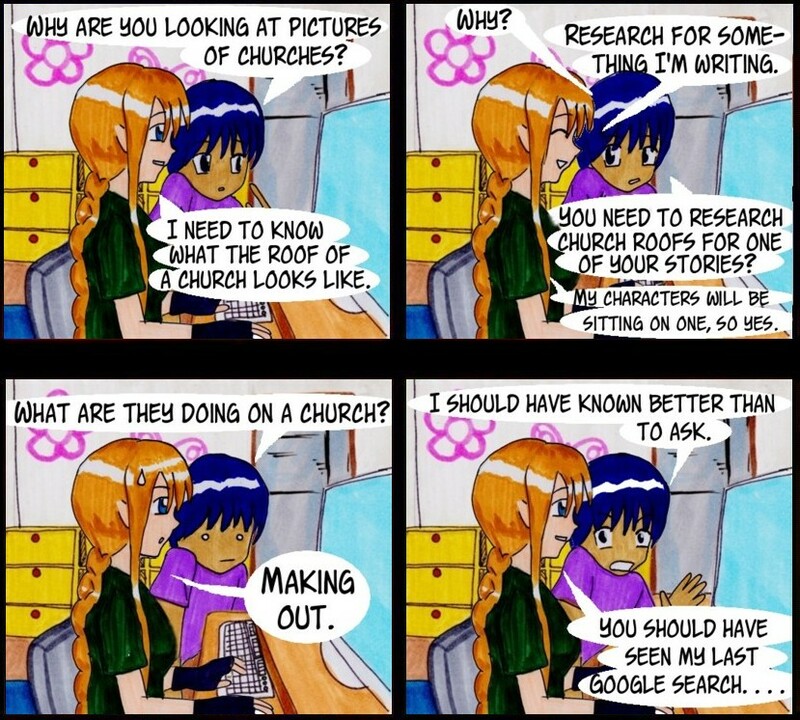 This conversation didn’t actually happen, but I did actually have to search for images of church roofs for the reason discussed above so I could include relevant description. The novel in question was Stupid Questions. Writers have to ask questions. Sometimes the questions we ask sound bizarre or suspicious or just plain random. But there is a method to our madness. We have to ask weird questions to make the facts line up, and nothing’s worse in the fiction world than a novel by a person who didn’t bother to check hir facts. Note: Yep, every question featured in this issue is something I actually had to research for one of my projects. Not all for the same project, though. I needed to know about wild animals in Connecticut because of beach-living weirdos from alternate dimensions in my webcomic, Negative One. I had to find out about how long a cross-country bus trip would take because of a poignant pilgrimage in The House That Ivy Built #4. The question about expiration dates for condoms was necessary because the good little love bugs in my most recent novel, Stupid Questions, actually pay attention to birth control like responsible people even though they are in a science fiction romance. And I promise I’ve asked a few research questions that I wouldn’t feel comfortable printing here. . . .